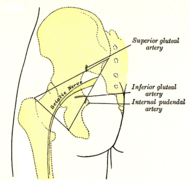 Left gluteal region, showing surface markings for arteries and sciatic nerve. Sciatica, otherwise known as sciatic nerve dysfunction, is a condition of pain or discomfort associated with the sciatic nerve. It is caused by general compression, inflammation, and/or other irritation of one of five nerve roots that are branches of the sciatic nerve, such as a protruding (herniated) disk in the spinal column compressing the roots located there. The sciatic nerve is the longest nerve in the human body, extending from the lower back, through the buttocks, and down the length of the leg. The pain from sciatica thus can be felt in the lower back, buttocks, and/or various parts of the leg and foot. In addition to pain, which is sometimes severe, there may be numbness, muscular weakness, and difficulty in moving or controlling the leg. Typically, the symptoms are only felt on one side of the body. Although sciatica is a relatively common form of low back pain and leg pain, the true meaning of the term often is misunderstood. Sciatica is a set of symptoms rather than a diagnosis for what is irritating the root of the nerve, causing the pain. It is a signal that something is not right and to look for the underlying cause. This point is important, because treatment for sciatica or sciatic symptoms will often be different, depending upon the underlying cause of the symptoms. While some causes of sciatica are not preventable (disk degeneration, pregnancy, etc. ), there are also preventable causes (overweight, poor posture, over exertion, etc.). To maintain the delicate harmony in the body, it is important to exercise, keep weight in balance, maintain good posture, and so forth. The sciatic nerve (also known as the ischiatic nerve) is a large nerve that starts in the lower part of the spinal cord, runs through the buttocks, and down the back of the leg to the foot. It is the longest and largest single nerve in the body. It is about the thickness of a person's thumb. The sciatic supplies nearly the whole of the skin of the leg, the muscles of the back of the thigh, and those of the leg and foot. Specifically, the sciatic nerve enters the lower limb by exiting the pelvis through the greater sciatic foramen, below the Piriformis muscle. It descends midway in the greater trochanter of the femur and the tuberosity of the ischium, and along the back of the thigh to about its lower third, where it divides into two large branches, the tibial and common peroneal nerves. This division may take place at any point between the sacral plexus and the lower third of the thigh. When it occurs at the plexus, the common peroneal nerve usually pierces the piriformis muscles. In the upper part of its course, the nerve rests upon the posterior surface of the ischium, the nerve to the quadratus femoris, the obturator internus, and gemelli; it is accompanied by the posterior femoral cutaneous nerve and the inferior gluteal artery, and is covered by the Gluteus maximus. Lower down, it lies upon the adductor magnus, and is crossed obliquely by the long head of the biceps femoris. The nerve gives off articular and muscular branches. The articular branches (rami articulares) arise from the upper part of the nerve and supply the hip-joint, perforating the posterior part of its capsule; they are sometimes derived from the sacral plexus. The muscular branches (rami musculares) are distributed to the following muscles of the lower limb: Biceps femoris, semitendinosus, semimembranosus, and adductor magnus. The nerve to the short head of the biceps femoris comes from the common peroneal part of the sciatic, while the other muscular branches arise from the tibial portion, as may be seen in those cases where there is a high division of the sciatic nerve. The muscular branch eventually gives off the tibial nerve and common peroneal nerve, which innervates the muscles of the (lower) leg. The tibial nerve goes on to innervate all muscles of the foot except the extensor digitorum brevis (peroneal nerve). Sciatica is generally caused by the compression of a lumbar spine nerve root L4 or L5 or sacral nerve roots S1, S2, or S3, or far less commonly, by compression of the sciatic nerve itself. When sciatica is caused by compression of a lumbar nerve root, it is considered a lumbar radiculopathy (or radiculitis when accompanied with an inflammatory response) from a spinal disc herniation (a herniated intervertebral disc in the spine), or from roughening, enlarging, and/or misaligning of the vertebrae (spondylolisthesis), or degenerated discs. Discs can become strained and weak because of a number of reasons, such as twisting and bending movements, heavy lifting, bad posture, pregnancy, degenerative disc disease, or obesity. Other medical conditions may also put pressure on the sciatic nerve, including diabetes, tumor, abscess, blood clot or bleeding in the pelvis, and never disorders. Causes also include direct trauma inflicted by an injection into the buttocks, fractures on the pelvis, gunshot wounds, prolonged external pressure on the nerve, and pressure on the nerve from nearby body structures and nerve entrapment, which occurs when pressure is applied on the nerve when it passes through a narrow structure. The damage slows or prevents conduction of impulses through the nerve. There are cases when the definite cause for sciatica cannot be identified. The following are some commonly identified causes of sciatica. One cause of sciatica is a spinal disc herniation, pressing on one of the sciatic nerve roots. The spinal discs are composed of a spongiform cartilage with a liquid center. The discs separate the vertebrae, thereby allowing room for the nerve roots to properly exit through the spaces between the L4, L5, and sacral vertebrae. The discs cushion the spine from compressive forces, but are weak to pressure applied during rotational movements. That is why a person who bends to one side, at a bad angle, to pick up a piece of paper may more likely herniate a spinal disc than a person falling from a ladder and landing on his or her back. Herniation of a disc occurs when the liquid center of the disc bulges outwards, tearing the external ring of fibers, and compresses a nerve root against the lamina or pedicle of a vertebra, thus causing sciatica. Other compressive spinal causes include Spinal Canal Stenosis, a condition wherein the spinal canal (the spaces through which the spinal cord runs) narrows and compresses the spinal cord. This narrowing can be caused by bone spurs, vertebral dislocation, inflammation, or herniated disc which decreases available space for the spinal cord, thus pinching nerves in the spinal cord that travel to the sciatic nerve and irritating them with friction. The sciatic nerve runs through the piriformis muscle in the buttocks region beneath the gluteal muscles. When the muscle shortens or spasms due to trauma, it can compress or strangle the sciatic nerve beneath the muscle. This cause of sciatic symptoms is piriformis syndrome. This may be the major cause of sciatica when the nerve root is normal. Sciatica may also be experienced in late pregnancy, primarily resulting from the uterus pressing on the sciatic nerve, and, secondarily, from the muscular tension or vertebral compression consequent to carrying the extra weight of the fetus, and the postural changes inherent to pregnancy. Because of the many conditions that can compress nerve roots and cause sciatica, treatment and symptoms often differ from patient to patient. Diagnostic tests can come in the form of a series of exams a physician will perform. Patients will be asked to adopt numerous positions and actions such as squatting, walking on toes, bending forward and backward, rotating the spine, sitting, lying on back, and raising one leg at a time. Increased pain will occur during some of these activities. Imaging methods such as MR neurography may help diagnosis and treatment of sciatica. MR neurography has been shown to diagnose 95 percent of severe sciatica patients, while as few as 15 percent of sciatica sufferers in the general population are diagnosed with disc-related problems. MR neurography is a modified MRI technique using MRI software to provide better pictures of the spinal nerves and the effect of compression on these nerves. MR neurography may help diagnose piriformis syndrome, which is another cause of sciatica that does not involve disc herniation. In IDET, a needle is inserted into the affected disc, guided by x-ray. A wire is then threaded down through the needle and into the disc until it lies along the inner wall of the annulus. The wire is then heated that destroys the small nerve fibers that have grown into the cracks and have invaded the degenerating disc. The heat also partially melts the annulus, which triggers the body to generate new reinforcing proteins in the fibers of the annulus. In radiofrequency discal nucleoplasty, a needle is inserted into the affected disc, although instead of a heating wire, as in IDET, a special RF probe (radio frequency) is used. This probe generates a highly focused plasma field with enough energy to break up the molecular bonds of the gel in the nucleus, essentially vaporizing some of the nucleus. The result is that 10-20% of the nucleus is removed which decompresses the disc and reduces the pressure both on the disc and the surrounding nerve roots. This technique may be more beneficial for sciatica type of pain than the IDET, since nucleoplasty can actually reduce the disc bulge, which is pressing on a nerve root. The high-energy plasma field is actually generated at relatively low temperatures, so danger to surrounding tissues is minimized. An approach to treating sciatica is to reduce the compressive forces causing the pressure upon the sciatic nerve. This can be accomplished through traction and realignment therapeutic procedures in the case where the sciatica is spinal-related. Chiropractic manipulation for the restoration of normal joint biomechanics and reduction of histochemical irritation to the involved nerves. Massage therapy to the involved lumbopelvic muscles. Structural Integration A systematic approach designed to reorganize major joints, and body segments (such as the lower back region and sacrum), while releasing the chronically held tension and torsion patterns. The goal is to achieve a rapid change in structural mechanics and correction of chronic musculoskeletal pain or dysfunction. ↑ Cedars-Sinai, Sciatica, Cedars-Sinai (2007). Retrieved December 18, 2007. ↑ A. M. Lewis, R. Layzer, J. W. Engstrom, N. M. Barbaro, and C. T. Chin, "Magnetic resonance neurography in extraspinal sciatica," Arch. Neurol. 63(10, 2006): 1469-1472. ↑ British Broadcasting Corporation (BBC), "Is your wallet a pain in the back?" Retrieved December 19, 2007. ↑ A. Filler, J. Haynes, E. Sheldon, J. Prager, J. P. Villablanca, K. Farahani, D. McBride, J. S. Tsuruda, B. Morisoli, U. Batzdorf, and J. P. Johnson, "Sciatica of nondisc origin and piriformis syndrome: diagnosis by magnetic resonance neurography and interventional magnetic resonance imaging with outcome study of resulting treatment," Journal of Neurosurgery: Spine 2(2005): 99-115. ↑ Richeimer, S., "New technologies for treating sciatica and back pain," SpineUniverse (2007). Retrieved December 19, 2007. American Academy of Orthopaedic Surgeons, "Sciatica". This page was last modified on 24 August 2015, at 16:12.